Fortunately, a few trainers have generously agreed to share with us the most common and most aggravating habits they see gymgoers developing - and a little free advice on how to fix them. This is, in effect, money in your pocket. Today: shoulder press. "I often see people who try the standing shoulder press leaning back and pressing up and out in front of the body. This is usually due to using too much weight, struggling with mobility issues in the shoulders, or both. Try using a high incline bench in the seated position and work your way to the standing position. Once you're back on your feet, work with a manageable weight that allows you to shoot your head under the bar while keeping the bar directly over the shoulders and heels." "Bending your wrists throughout the barbell shoulder press can limit your ability to extend the triceps. The cure, fortunately, is quite simple: While setting up, be sure to keep the knuckles facing slightly forwards - never backwards towards you - and drive the elbows so that they are an inch or two in front of the barbell. With your elbows under straight wrists, punch the weight off the body by reaching overhead rather than pressing. This mental cue will force you to keep the back tight and shoulder blades stable." 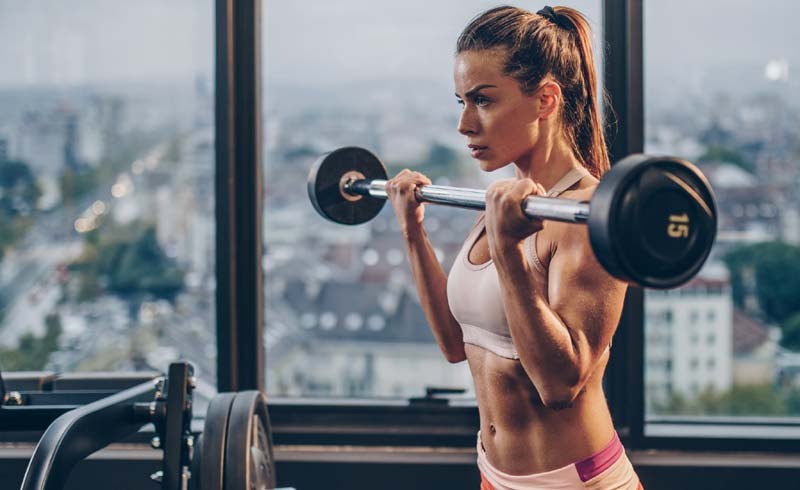 "Because using a barbell always entails the same range of motion, I usually recommend using dumbells over barbells for this exercise in particular. When you press the weights overhead, stop an inch short of locking out your elbows in order to keep the lateral deltoids engaged through the movement. 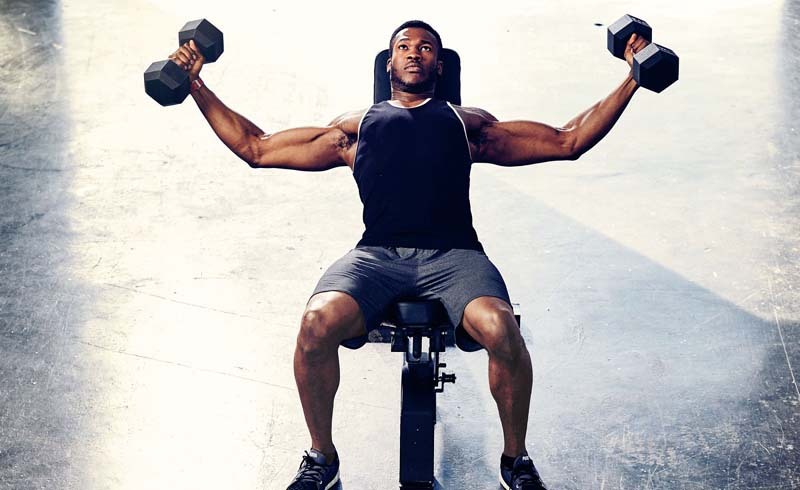 When you lower the weight, do it slowly over a one-count, but then stop when the dumbbells are parallel with your ears, because that's the point at which you should begin pressing back up. Shoulder problems can easily develop, especially when using heavier weights, if you lower the load all the way down to tap the shoulders." "Many people complain that the shoulder press hurts their lower back. This happens because, in an effort to do whatever it takes to get the weight up up, it can be easy to arch your back - even if you're seated - to try and eke out an extra boost, making the exercise a little more like the incline bench press. This is one where it's important to think about which muscles the motion is supposed to be targeting, and which muscles it isn't. If you find yourself cheating like this, use less weight, and begin each set by pressing your lower back firmly into the seat. If you're standing, make sure that your shoulders stay above the hips."